Supplements to "The Nevada They Knew"
This double biography and critical study tells the story of the friendship between Nevada's leading artist and leading novelist of the twentieth century. 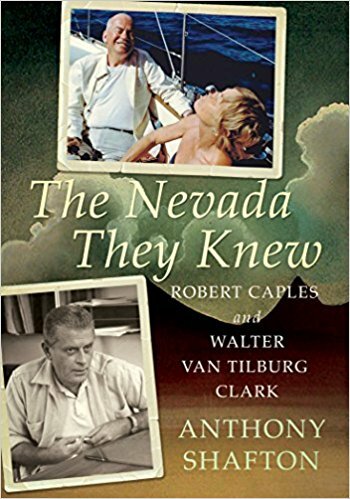 The Nevada They Knew is also a memoir, of Shafton's friendship with Caples, his attachment to Clark's novel The City of Trembling Leaves, and his connection to a land both men taught him to love. 105 pages of sourcing and additional comments by the author, indicating by a key word or phrase the material that is sourced and/or amplified on a specified page of the book. A bibliography of published sources (excluding newspapers) consulted for the book, serving as a resource for further information. A very comprehensive listing of topics, names, and titles of the works of art and literature mentioned in the book as well as the notes. A small manuscript collection in Special Collections, on the third floor of the Mathewson-IGT Knowledge Center consisting of eight letters from Caples to Shafton and five to Caples between 1977 and 1980. The collection is open to the public 9-5 Monday through Friday. More information about the collection.